Nubra Valley TourNubra valley tour is one of the best tour destinations in India. The Nubra valley means Ldumra (the valley of flowers), situated in the north of Leh, situating 10,000 ft above the sea level. The main attraction in this area is Bactarian Camels (Shaggy double hump Camel) around sand dunes, Deskit and Samstanling monasteries and Khardung la Pass (18,380 feet.) The Nubra valley lies in the north of Leh and is accessible over the Khardong La Pass 5600 m. which is considered to be one of the highest motor-road in the world. The road to Nubra valley leads through Khardongla (the highest motor able road in the world) 18380 ft. around 50 km away from Leh. After crossing the pass, you can have a view of Khardong village, Khalser and Deskit (the main villages of Nubra valley). The Deskit village offers Guest Houses and lower budget hotels. The Camel safari can be organized from Deskit to Hunder village for 2 hours. Hundar village has small monastery and it is located on ancient Silk Route. The road passes through a bridge laid on Glacier which finds its way in Guinness book of world record. The Nubra valley was open for foreigners in year 1994 by the Indian government in order to expand tourist destination in Ladakh Region. This valley is on the trade route from Leh and is accessible via Samsar and Karakoram Pass. Along with unparallel trekking opportunities, the valley has several Buddhist monasteries such as Diskit Gompa which is considered to be 350 years old situated on the highest point near the village. Day 01: Arrival in Delhi and transfer to domestic airport for flight to Leh. Day 02: In Leh:Tour of Leh city, including the 17th century palace and Gompa. Day 03-04: In Leh: Touring the monasteries and palaces of the Indus valley. Day 05: Sightseeing:Take a morning stroll to Sankar Gompa, then to the nearby village of Sabu. Overnight stay in Sabu. Day 06: In Sabu, one can get horses to begin the trek. First day takes the trekkers through lovely grazing areas to the campsite at Polu Digar. From this vantage point, the Stok mountains appear to float majestically above the Indus valley. Day 07: Continue upward to the Digar La base camp. A short day to aid acclimatization. Day 08: One makes an early start to cross the 17,230 ft, Digar La. 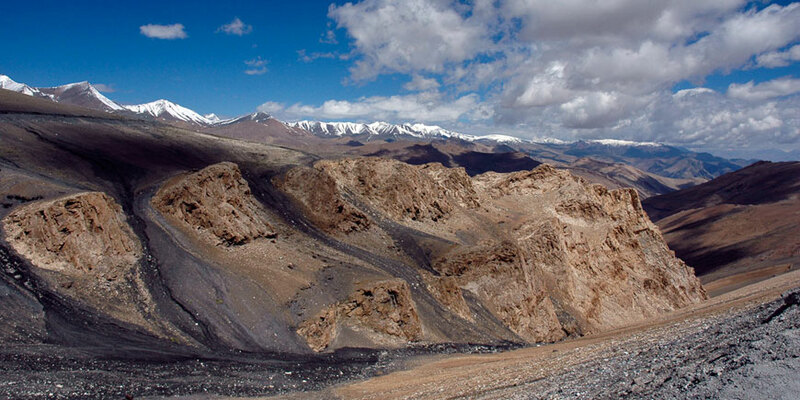 From the top, views stretch south to the Zanskar range and north to the Saser range, Ladakh's highest peaks. The descent is steady and one can camp by a lovely meandering stream at Chumik Yogma. Day 09: Continue down through the village of Digar to the tiny settlement of Aghyam. Day 10: Trek to Tangyar, a prosperous village in a remarkable location. Day 11: Continue upward to Dhungle, base camp for the pass. Day 12: Ascend the 17,061 ft Wuri la for views all the way to the Karakoram in Pakistan! Descend to camp at Zule Tokpo. Day 13: Finish the trek with a short walk out to the village of Sabu, and the Thak Thok Gompa, an ancient shrine built within an impressive cave. Travel by jeep over 18,000 ft plus Chang la to the village of Tangtse, where one can camp amongst idyllic meadows. Day 14: Explore the shoreline of the brilliant turquoise and azure Pangong Lake, Ladakh's largest and one of the great salt lakes of Central Asia. Proximity to the Chinese border prevents one from penetrating much beyond the western shore or camping at the lakeside, but the views are stupendous. Return to Leh takes one back over Chang la, the second highest motorable road on earth. Back in the Indus valley, one can visit the little-known Gompa of Chemrey before returning to Leh that evening. Day 16: Departure- Delhi and transfer to airport for catching a flight to onward journey.